If you have a booking but do not have a Trainline Europe account, visit the confirmation page of your booking (via the link provided in your confirmation email). If you have an account, visit the Ticket’s section of your Trainline Europe account. Please select the ticket that you wish to cancel and click Cancel. 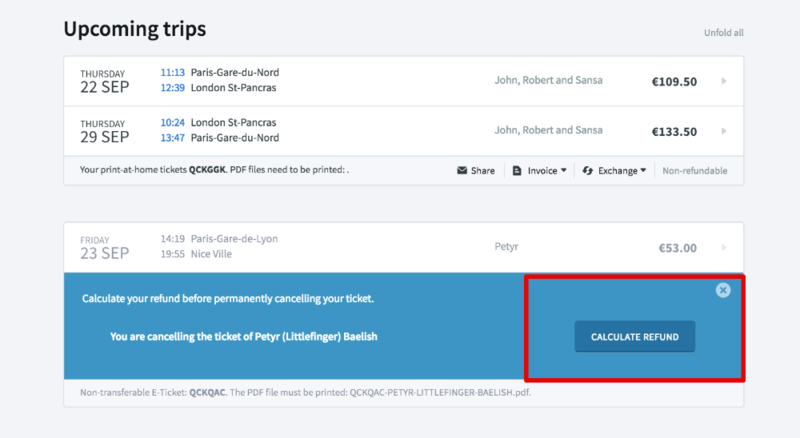 You will have the option (depending on your type of ticket) to cancel only a segment of your journey or the entire trip. For some tickets, you can also cancel individual passengers from your reservation. If you wish to do this, just select the relevant passenger(s). You can now review your refund amount. Proceed by clicking on calculate refund. Once you have clicked on calculate refund, you will be shown how much you will be refunded. If you are sure that you want to cancel, click confirm. Please be careful as cancellations are final and irreversible, hence why we have added an additional confirmation screen. If you do not see a "cancel" button but your fare conditions state that you should be able to cancel, please contact us immediately. E-tickets: The refund will be processed immediately and there’s nothing further to be done. It will take between 3 to 14 working days for the refund to be credited back to you, depending on how quickly our friends at the bank process the transaction. Print-at-station ticket (not yet printed): You do not have to take any further steps and your refund will be processed immediately as well. Keep in mind that it can take anywhere from 3 to 14 working days for the refund to be credited back to you. Print-at-station ticket (already printed): You must send us the original tickets by post as we are required to stamp them and scan them for the rail operator. We cannot accept or refund tickets which have already been validated. Please note that we have to receive the tickets a maximum of 1 month after the cancellation. After this, the tickets are no longer refundable. We strongly recommend sending the tickets by insured mail. We are not able to take any responsibility for them getting lost or stolen in the post. We will notify you by email as soon as we have received the tickets and have refunded you. If you haven't heard from us after a while and you're a bit worried, you can always get in touch here and we’ll gladly help! Can I cancel my ticket at the station/at the ticket counter? Yes. You can cancel your ticket in an emergency situation calling the rail operator directly. You will need to be able to give them your booking reference and name so make sure you have this prepared. Once they have cancelled your tickets, you must request a refund by writing to us here. We are not informed by the rail operator of the cancellation, so please do not forget to inform us. You can find all important phone numbers by clicking here.